This is a very special make for me. One that represents loss, love, remembrance, friendship, community and compassion. 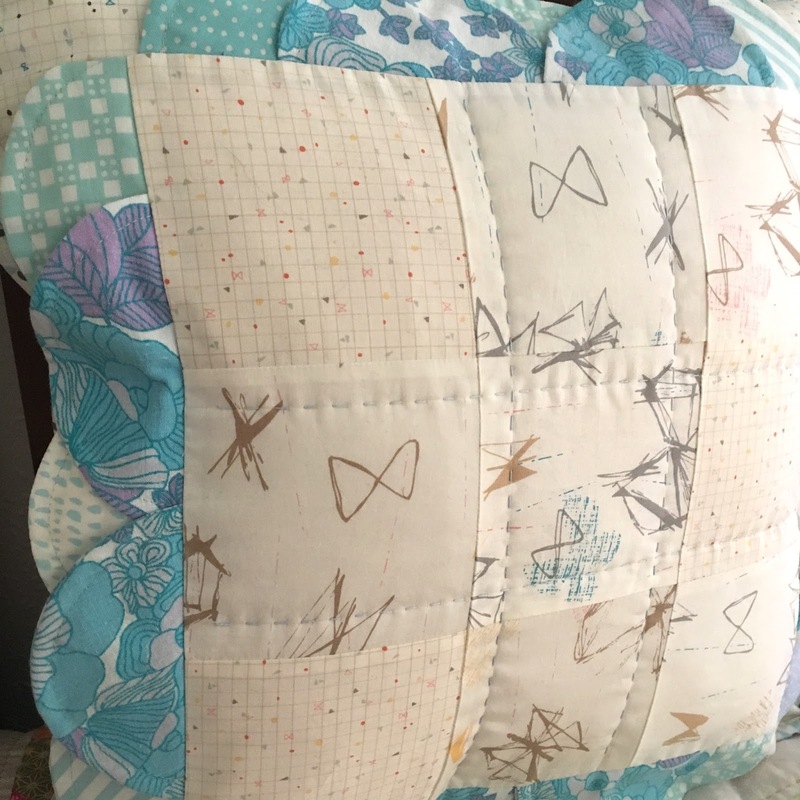 Last year when my friend Nat tragically lost her youngest son, I put a call out on social media asking for low volume nine patch blocks to make into a quilt. 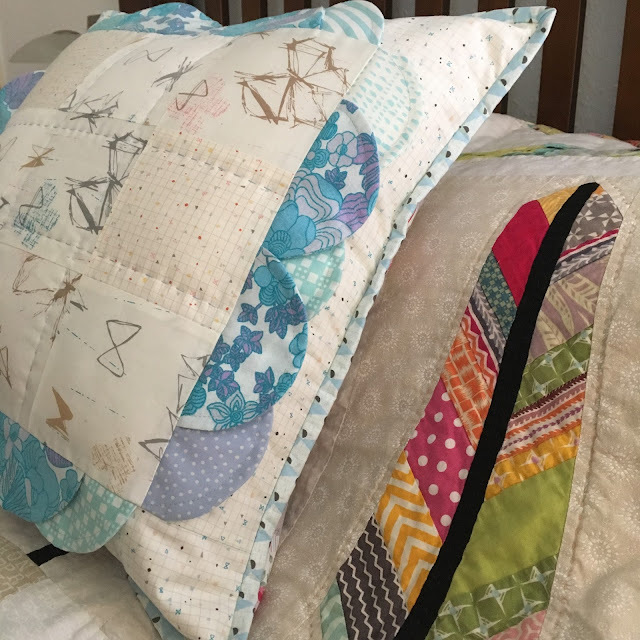 Quilters generously made and sent beautiful blocks from around the world and I was able to make three quilts for Nat and her family. You can read about the 'there are no words' quilts here. The lovely Sharon Holland contributed a block to the quilt and also sent an extra one, which she said I could use in the quilt if needed or save it to create my own make. I'm actually crying as I remember how it felt to read all the thoughtful cards and notes that were sent, not only to Nat but also to me. The sadness is a fraction of what Nat experienced and continues to experience and that was what compelled me to do the work of providing tangible quilts, to show her and her family the love, comfort and sympathy we all wanted to give. I decided to keep the block and, although it has taken me some time to come to use it, I will treasure this cushion and all it represents. The life of a precious little boy. 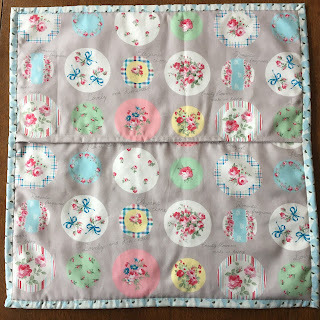 I had some vintage sheet fat quarters that I have had stashed for a long time, after a swap organised by Mary Emmens. I wanted to add something to represent joy, as a celebration of little baby MiH's short life. Also Nat is a big advocate of upcycling and caring for the planet so I thought she would like me using vintage. 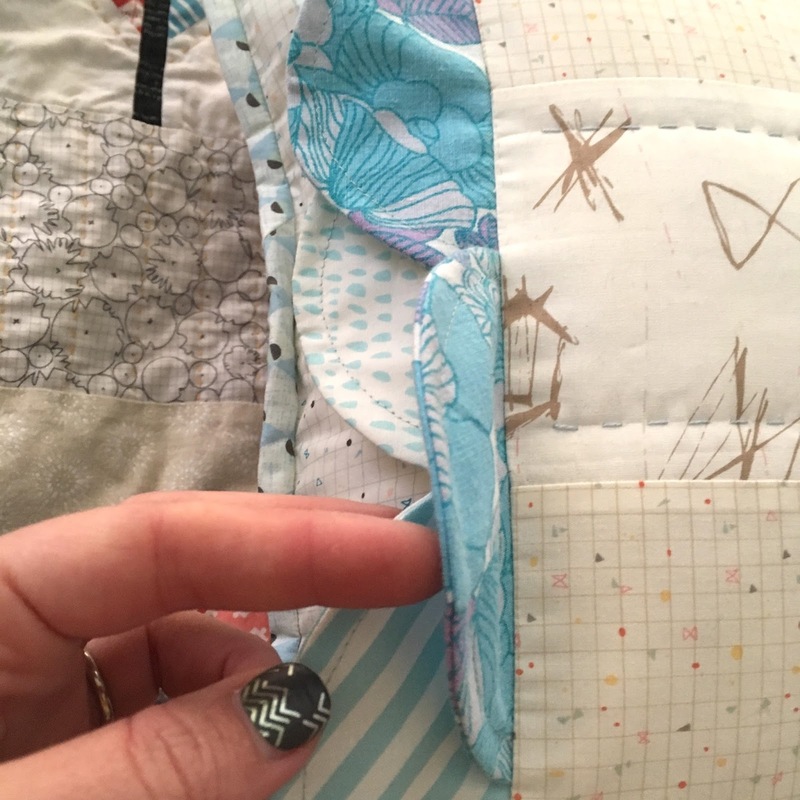 I decided to add more texture by creating half circle scallops to trim the edges of the block, for my easy tutorial on how to make them click here. 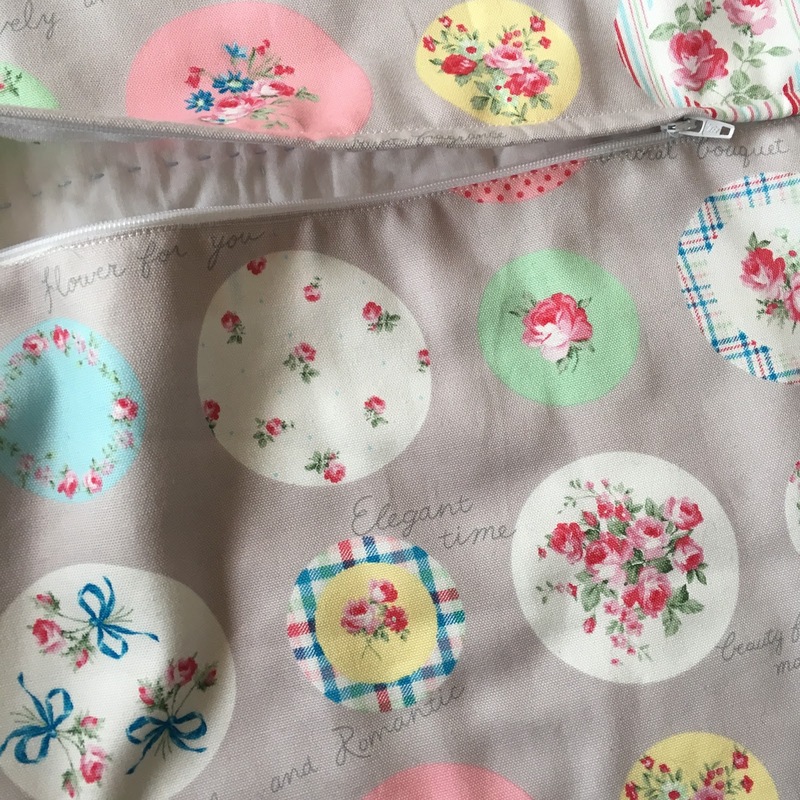 They feel lovely, the soft vintage fabric was perfect and the florals mix really well with the modern prints. 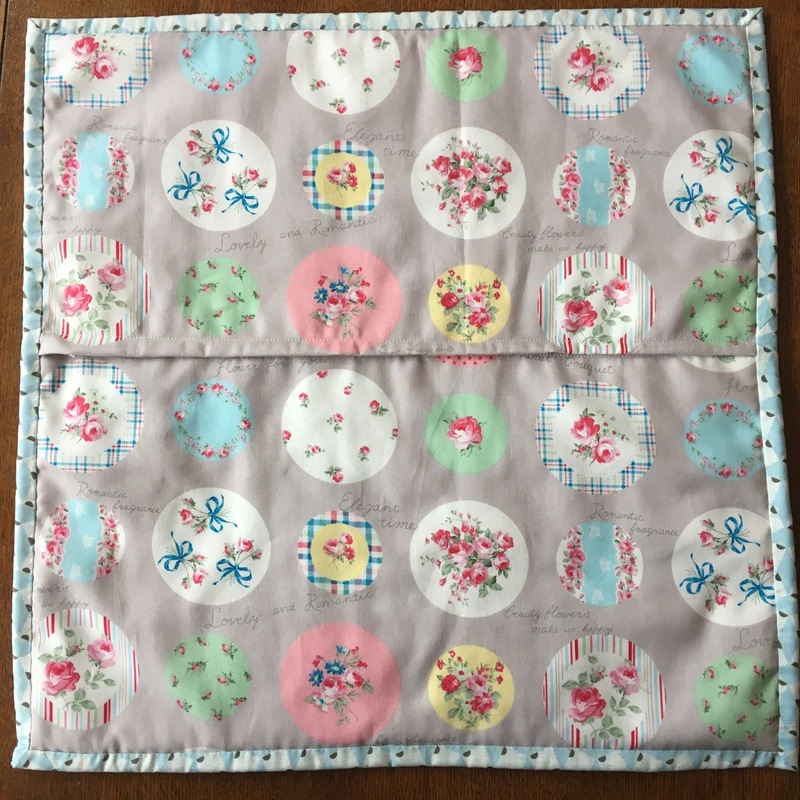 The border and binding fabrics are from Gossamer by Sharon Holland - the same range she originally used to make the nine patch. I had been saving these prints and using some here felt perfect. 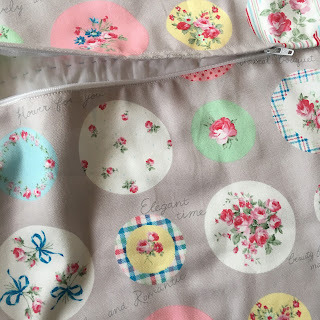 The back is a pretty Yuwa print and I made a covered zip back using this clever and simple tutorial by Adrianne at On The Windy Side. I am keeping this cushion away from the kids and visitors and the cat. It's mine and will live in our bedroom. I made my own cushion inner using some stuffing and an old pillowcase. Very simple and easy to do. It has made the cushion very plump and some use will help get it into a better shape! 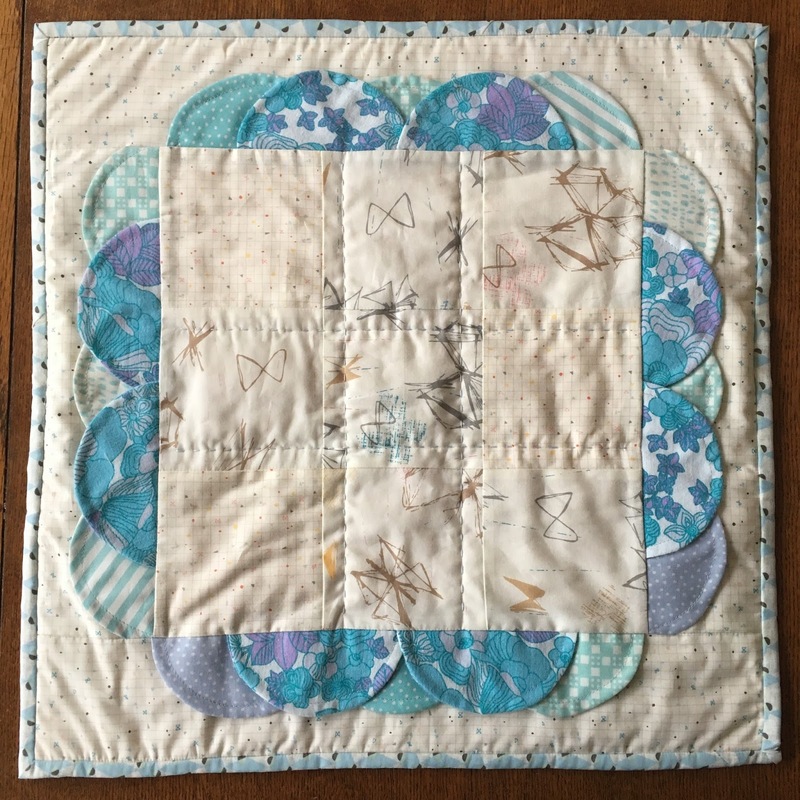 I used a pale blue perle thread to quilt the nine patch block. I quilted 1/4" away from the seams to make a hashtag pattern, a reminder of #therearenowordsquilt. I think about little baby MiH and his mum often. I hold them both in my thoughts. Thank you again to everyone that contributed to making the quilts, to all of you for the kind notes you sent. 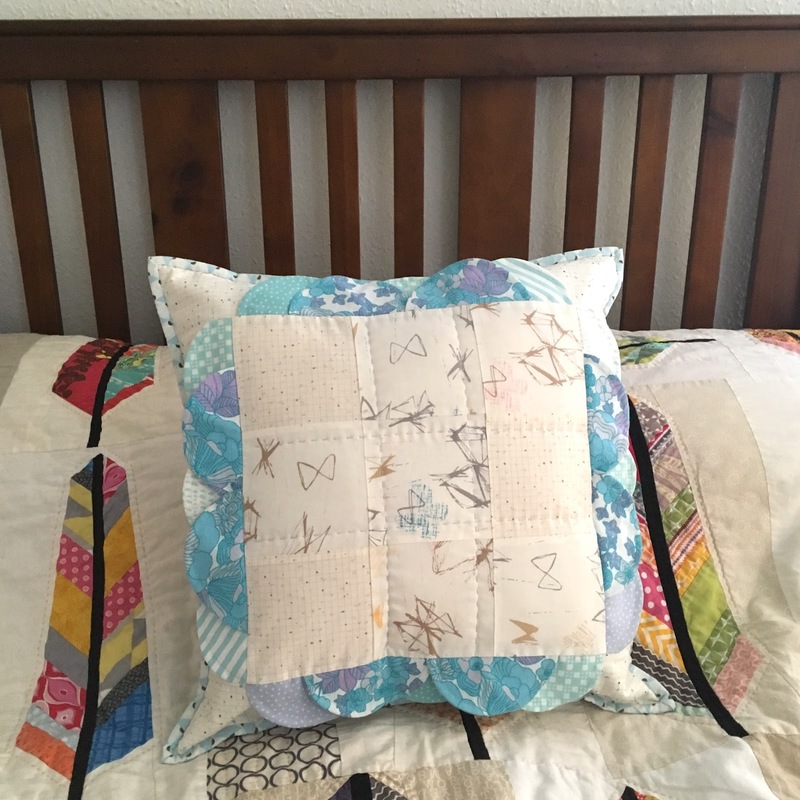 Thank you Sharon for making it possible for me to create my own cushion, as a remembrance and celebration. And to my friend Nat, through the grief and pain you have such strength. I see you and the amazing job you do as a mother. I am always here for you and look forward to our always random chats through the crazy and fun times ahead. The cushion was on my FAL list and is my last finish before quarter 3 starts. There's still a lot of quilts on that list left for me to finish, there will have to be roll overs! The vintage and modern fabrics look like they were made for each other. A beautiful cushion and one you will always treasure. This is an amazing finish Lucy! Its beautiful and a lovely way to treasure and remember. If only it was possible to sew all the bad things out of existence... - but we can sew good things into existence. A beautiful cushion with so many meanings, I'm sure it will be treasured. That's a lovely way to remember the little one! That is so gorgeous, a beautiful finish. What a moving testament to friendship, life and all that is precious. Bless you. What a beautiful, touching, emotional finish, Lucy. I really like your vintage scallops - what a super idea. On behalf of the FAL hosts, thanks for playing along!